The purchase of silver bars is often viewed as an excellent means of protecting one’s wealth against the fluctuations of stock and bond markets. However, buying silver bars can also be done to capture beautiful designs in this stunning precious metals. There is a new collection of silver bars from A-Mark Precious Metals celebrating America’s Olympic athletes. Today, 10 oz Silver US Olympic Team Bars are available to you online at Silver.com. Ships to you heat-sealed in individual plastic or multiples of 50 bars in master boxes! Commemorates US Olympic Team athletics! Obverse features the emblem of the US Olympic Committee. The United States Olympic Committee was formed in 1894 to support the endeavors in training American athletes to perform on the global stage in the Olympic Games. The USOC is based in Colorado Springs, Colorado, from where it provides training, assistance, and other support to American athletes preparing to participate in games around the world. It is the job of the United States Olympic Committee, or USOC, to prepare athletes and support them at the Olympic Games, Paralympic Games, Youth Olympic Games, Pan American Games, and the Parapan American Games. 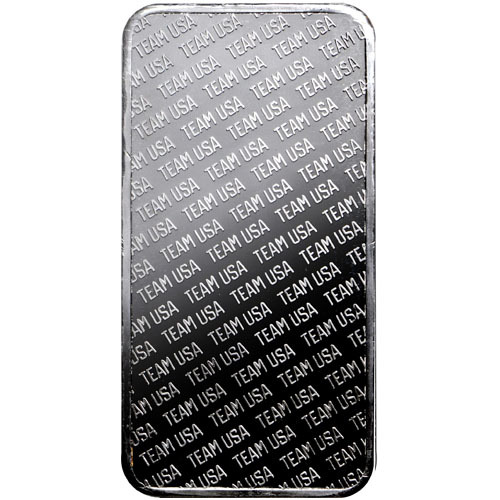 You can now capture the USOC symbol on a stunning silver bar. 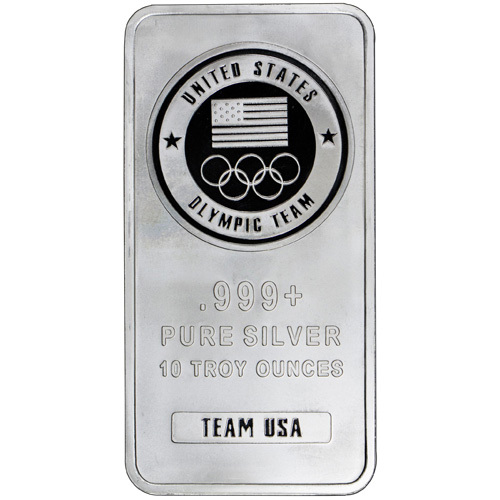 The 10 oz Silver US Olympic Team Bar is available for purchase as an individual product or in multiples of 500 bars with a total of 500 Troy ounces of .999 fine silver. The individual bars from A-Mark Precious Metals arrive inside of heat-sealed protective plastic packages. For multiples of 50 bars, the 10 oz Silver US Olympic Team Bars are available in a master box container. On the obverse of all Silver US Olympic Team Bars you’ll find the emblem of the United States Olympic Committee. The USOC is the National Olympic Committee of the United States, and it is one of only four such committees in the world that represents its nations Olympic athletes and Paralympic athletes. The USOC has supported American Olympians since its formation in 1894, sending athletes to the first modern games in Athens, Greece in 1896. The reverse of the 10 oz Silver US Olympic Team Bars features a repeating phrase. You’ll find the words “Team USA” repeating on this face of the bar on a roughly 45-degree angle. Team USA has been represented by athletes at every Olympic Games since 1896, with the exception of the 1980 games. American Olympians have won a stunning 2,522 medals at the Winter and Summer Olympics since 1896. Please don’t hesitate to reach out to Silver.com if you have questions. You can reach our customer service team on the phone at 888-989-7223, on the web using our live chat, and via our email address.